The creation of a new tier within the Football League to accommodate Premier League B teams is at the heart of the Football Association commission's four-point plan to boost English football. The review also calls for a ban on non-European Union players outside of the top flight and a reduction in non-home-grown players in Premier League squads. It also wants to develop "strategic loan partnerships" between clubs. 10 Premier League B teams and 10 from the Conference would take part. 20 of the 25 players in the squad should qualify for the home-grown rule. 19 of the 25 players in the squad should be under the age of 21. The suggestions are a response to a growing lack of English talent. 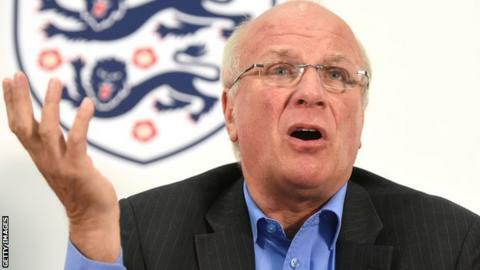 Liverpool, Manchester United and Manchester City are among clubs that have already shown "a lot of interest and enthusiasm" for a new league for B teams, FA chairman Greg Dyke told a news conference. According to the review, headed by Dyke, only 32% of starters qualified to play for England in the 2012-13 Premier League season, compared to 69% 20 years ago. The commission's proposals set an "ambitious but realistic" target of increasing the number of English players in the Premier League to 45% by 2022. The FA's report added: "This is still lower than the figures being achieved in Germany and Spain today but it would take English football back to a figure last achieved in 2000." England manager Roy Hodgson said he welcomed the proposals. But he added: "I am just one voice of many who have contributed to this important study and I hope the debate that has been provoked can lead to some real developments in our game." The most controversial proposal would be establishing a new League Three in 2016-17, made up of 10 Premier League B teams and 10 Football Conference sides. B teams could be promoted and relegated between Leagues One, Two and Three and the Conference, but could not play in the Championship and must always be at least one division below the full side. They would also be barred from entering domestic cup competitions like the League Cup and FA Cup. The B team squads would require 20 out of 25 players to qualify for the home-grown rule and no non-EU players would be allowed. Nineteen players would have to be under 21. The commission also recommended a phased reduction in the number of non-home-grown players in Premier League squads from 17 to 12, reaching their target by 2021. A cap of two non-EU players per squad has also been proposed, plus a ban on non-EU players outside of the Premier League. The strategic loan approach is designed to allow clubs from the top two English leagues to loan players to a lower division 'partner' club to enable greater opportunities for 18 to 21-year-old English footballers. Area 1 - Inadequate and insufficient playing opportunities for 18-20 year-old elite players at top clubs. Area 2 - Regulation of the player market in England is not effective in preserving the desired balance of British, EU and non-EU players in clubs. Area 3 - Coaching and coach development, essentially at grassroots level, have not yet reached a satisfactory level and impact. Area 4 - England lags behind in the quantity and quality of affordable grassroots facilities, particularly in the provision of all-weather pitches. Dyke said: "This isn't about players even for four years' time, this is for players for 10 years' time. This is to win the 2022 World Cup, by which time I'll be long gone." He added there was a lot of "enthusiasm from the big clubs". "Liverpool, the Manchester clubs, Stoke, Tottenham - they have no problems with me mentioning them on this - so quite a lot of clubs recognise the problem they have got," he said. "The gap between the academy and the first team has widened significantly in 20 years. Many of the clubs we spoke to called this the 'Bermuda Triangle' or 'black hole' of English football." In response, the Football League said the review "may not contain a solution that is acceptable at the current time". However, it said it would "continue to engage with the commission to establish whether there is a solution that meets its stated objective, but does not leave the Football League carrying a disproportionate or unreasonable burden". The FA commission was made up of Dyke, Hodgson, former England managers Glenn Hoddle and Howard Wilkinson, plus ex-England internationals Rio Ferdinand and Danny Mills. Football League chairman Greg Clarke, Professional Footballers' Association chairman Ritchie Humphreys, FA vice-chairman Roger Burden and Crewe Alexandra's director of football Dario Gradi were also part of the 10-man commission. It sought contributions from more than 650 people across all levels of the sport in England and abroad. The next step will be a consultation period on the report's proposals. No firm date has been given for a final decision. Listen to the podcast of Danny Mills and Steve Claridge debating the plan on BBC Radio 5 live here.